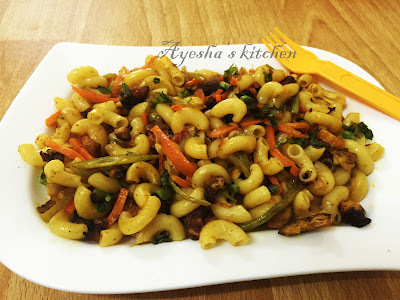 Pasta with vegetables/vegetable pasta recipe is a quick healthy snack or dinner meal idea for working moms. Veggies in pasta make it more vibrant and attractive for kids and they loved it. Though we have lots of chicken and macaroni recipes, still it is hard to find the best macaroni recipes. Mac $ cheese recipe is my favorite and I often pack it for my kid's snack box. Left over chicken strips or cubes adds special taste to this macaroni. Heat butter in a pan and saute garlic for a while and then add chopped onion. Saute well and then add beans. Cook for few minutes and add carrot, capsicum, salt and turmeric powder. Mix well and saute continuously. Now add cooked macaroni along with pepper powder and tomato sauce. Finally, drop the fried chicken cubes and mix well with the macaroni and serve hot.